Helene Cooper works for Imaginative Traveller, who run tours all over South America. Here she tells us about her recent trip to South America’s Patagonia, arguably the world’s best snow-capped wilderness, as part of their 23 day tour of Argentina and Chile. Having been blown away by the frenetic pace of Buenos Aires, I wanted to explore the region’s natural beauty, venturing into Patagonia, the pristine South American wilderness, where sweeping mountain valleys and deep blue lakes would make me lose all sense of time. For me Patagonia begins in the Magellan Straits, named after the Portuguese adventurer Ferdinand Magellan, the very first explorer to circumnavigate the entire globe. These waters are much calmer than the Drake Passage, a more violent stretch of water between Antarctica and South America. On arrival the weather was cloudy, with a thin mist covering the mountains, dampening the idea of beautiful clear skies and shimmering lakes, but I was sure things would improve. We made our way across a large gorge, and into an area of open sea, where we spotted a huge shipwreck, which was thick with rust, having clearly collided with a nearby rock many years ago. A casualty of this ‘safer’ route, the ship made me wonder about the perils of Drake Passage, and adventurers who had tried and failed to conquer its fierce resistance. After spending the day hiking across wet terrain, we made our way to a local guesthouse for a well-deserved cup of tea and rest, before we continued north by vehicle on a long journey up into Chile and on to Torres Del Paine National Park, which I was sure would be one of the highlights of the entire trip. The first actual morning in the park when I woke, the sun glistened through my window and the air outside was bright and crisp, with dew covering the grass – it was a perfect day to see Torres Del Paine in all its splendour. Some of the views were absolutely incredible: gigantic, booming mountains capped with the most pure-white snow, with crystal-like lakes mirroring the view from above; view upon view of deep blues and pearl-whites – it was like gazing into an ice-age paradise. Our hikes extended through thick, green, mossy hillsides, past tumbling glaciers and along rocky scree slopes, walking round the edges of amazing crisp glistening lakes, interspersed with periods of driving, where we could relax while marvelling at the beautiful views (Torres Del Paine National Park is home to 97km of roads that wind through the area’s landscapes, allowing you to explore its more unchartered areas). One of the most beautiful sites of Torres Del Paine National Park was undoubtedly the wildlife: watching birds of prey in the distance climb the mountain tops, arching their wings towards the clouds, before swooping towards the ground, was incredible. We were also lucky enough to see guanacos, ñandúes, foxes and huemuls. 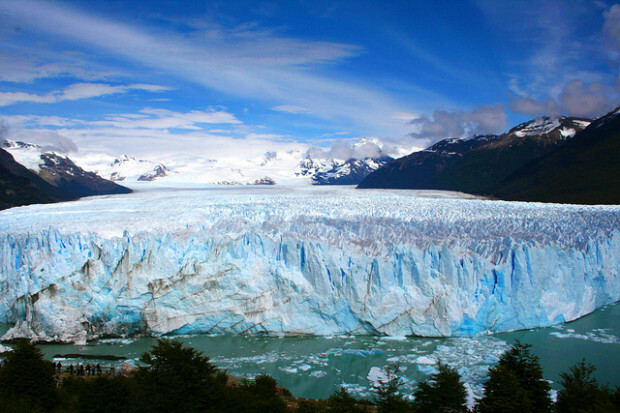 Our trip also took us further north and back into Argentina to Los Glaciares National Park and the Perito Moreno Glacier, a huge jagged plane of ice which sits in a deep valley, having frozen above the adjoining Lago Argentino. The glacier was absolutely huge, 30km in length and 75m high, it was like a giant boulder of leaden ice, with narrow navigable walkways. It’s amazing waiting for an iceberg to ‘calve’ – the ice turns a different hue as the sun rises and falls, creating a beautiful collage of colours – before you suddenly hear a loud crack, with a block dropping vertically into the lake below, breaking the silence and stillness of the mountains. I could go on forever about this trip, which extended further into Chile and the Chilean Lake Distrct and Santiago, but unfortunately I’m out of time and space – fortunately in Patagonia, space is something that’s not short in supply. Posted in Inspiration and tagged with Argentina, Chile, glaciers, Lakes, Mountains, Patagonia, South America. RSS 2.0 feed.